The Court Room within the palatial headquarters of Trinity House, located on Tower Hill. The ceiling paintings include allegorical figures, representations of the Thames, Medway, Severn and Humber, naval and merchant ships and Britannia. Above the doors at each end of the room hang paintings of Henry VIII (a copy of Holbein’s original) and a contemporary portrait of Elizabeth I by George Gower. The Thames and its estuary hold numerous dangers for navigation. In the reign of Henry VIII a group of master mariners formed what has become known as Trinity House to ensure safety on the river. Five hundred years later the organisation continues to play an important role in maritime navigation. Many vessels have run aground over the centuries in the Thames Estuary and its approaches, particularly in the days of sail, before reliable charts, and when ships’ tended to stay within sight of the shore in order to navigate by landmarks such as church spires. The Maplin Sands and many other long, shifting, tongues of sand lie up to forty miles off the Essex coast where the Thames meets the North Sea, to be avoided by ships passing into and out of the estuary on the way to east coast ports and beyond. Some are in a Y-shape, where an apparently deep channel ends in a fatal cul-de-sac. Ships en-route from London and east coast ports down to France and southern Europe must pass the Goodwin Sands off the Kent coast, described by Shakespeare in The Merchant of Venice as “where the carcasses of many a tall ship lie buried”. Well over a thousand vessels have been recorded as having been lost there since the late 15th century and parts of unrecorded, more ancient, vessels still occasionally snag the nets of fishing boats. It was vitally important for mariners to understand the underwater dangers, the ever-changing times of the tides according to the moon and location along the river, the effect of the wind, and to know local landmarks during poor visibility. In 1513 a group of eminent masters and mariners petitioned Henry VIII that the standard of pilotage on the river had declined in recent times and regulation of pilots was required. From its foundation by letters patent in May 1514 responsibility for safety on the river was given to ‘The Master, Wardens and Assistants of the Guild or Fraternitie of the most glorious and blessed Trinitie and Saint Clement in the parish Church of Deptford Stronde in the County of Kent’, otherwise known as Trinity House, Deptford. The organisation was to provide pilotage – the safe guiding of ships by experienced English pilots – along the Thames, particularly through its shifting sandbanks in the Estuary. The membership of Trinity House consisted of those with a wide range of nautical interests. An Act of Parliament of 1566 under Queen Elizabeth extended their responsibilities to ensure the upkeep and continuation of seamarks around the coast, those being landmarks such as church steeples and trees used by mariners to fix their position. In 1594 the provision of beacons and buoys was similarly transferred from the Lord High Admiral and the corporation gradually began providing lighthouses, their first probably being at Lowestoft in the early years of the 17th century. The cost to the corporation regarding all these works was funded by dues paid by ships arriving at London, where it was collected by the officials of Custom House, and at other ports. The 1594 Act also transferred the right to provide ballast to ships on the Thames, which was particularly necessary for colliers returning empty to Newcastle. Using wet ballast also reduced the cost of the important dredging of the Thames to prevent silting. The corporation’s rights and responsibilities were further extended in 1604 under James I, including the supervision of apprenticeships of seamen and to hold a court dealing with disputes, such as between masters and seamen or regarding damage to ships. From the beginning, Trinity House was involved in charitable work. Almshouses for elderly seamen and their widows were provided at Deptford. In 1695 Captain Henry Mudd, an Elder Brother, provided an estate of houses and chapel on his land at Ratcliff, much of which still remains at Mile End Road although no longer for its original purpose. Pensions were also paid to elderly or injured seamen, and by 1618 they were providing to one hundred and sixty people, which had risen to over one thousand one hundred in 1681. Trinity House was governed by a court of eighteen Elder Brethren, some of whom were leading mariners, navigators and naval men of their day, who met at least once each week. At some point in their early years a lower class of Younger Brethren came into being, numbering two hundred and fifty-four by 1629, mostly living around Stepney or Rotherhithe. The expansion of the membership effectively created a guild consisting largely of shipmasters, limited to natural-born Englishmen who could afford the subscription. The Brethren were headed by a Master, the first of whom was Thomas Spert, an experienced and eminent seaman from Stepney who rose through the ranks to captain the great Henri Grace à Dieu. He was knighted in 1529 and held the post until his death in 1541. After Spert, a new Master was elected at Trinity House every three years. The naval administrator and diarist Samuel Pepys held the position of Master on two occasions, as did the Duke of Wellington between 1837 and 1852. Since 1866 the Master has been an honorary role bestowed on a member of the royal family, with the management undertaken by the Deputy Master. For forty-two years it was held by the Duke of Edinburgh until his retirement in 2011 when it was conferred on the Princess Royal. Elder brethren have included Winston Churchill. In 1618 the working headquarters of Trinity House moved to Ratcliff, the area where many of London’s merchant seaman resided. Following the Restoration a move was made to Water Lane, close to the Tower of London. That building was destroyed in the Great Fire, as was its successor in 1714. After extensive repairs in the 1790s the headquarters moved for the final time into a grand building facing the Tower of London across Tower Hill, designed by the architect Samuel Wyatt and completed in 1796. It was largely destroyed during an air raid in December 1940 but restored with much Georgian detail in 1953 and is Grade 1 listed. Many of the historical records and artworks were destroyed in the fires and bombing yet the building still contains a magnificent collection connected to its history. As part of its responsibility for buoys and lighthouses, at the beginning of the 19th century Trinity House established riverside workshops near Blackwall, where the River Lea joins the Thames. From there maintenance work could be carried out and experiments undertaken, for which two lighthouses were built at the yard. The electrical scientist Michael Faraday was appointed Scientific Advisor in 1836 and undertook experiments that led to advancements in lighthouses around the coast. Trinity Buoy Wharf continued in operation until 1988 although the main buildings and one lighthouse remain. Trinity House continued as the sole authority for pilotage on the Thames and around the coast until 1986, by which time it managed around five hundred self-employed pilots. At that time responsibility for pilotage on the river was transferred to the Port of London Authority with Thames pilots directly employed. Trinity House continues as a licensed authority for deep sea pilotage in Northern European waters, as well as navigation aids, including lighthouses, lightships and buoys around England, Wales, the Channel Islands and Gibraltar. It continues to carry out charitable and educational work including a cadet training scheme. In modern times the Elder Brethren are supported by around three hundred Younger Brethren. 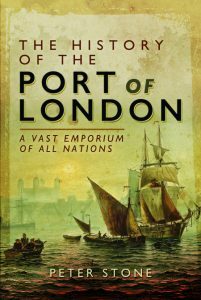 Sources include: G.G.Harris ‘The Trinity House of Deptford 1514-1660’; ‘Trinity House Headquarters Building’ (Trinity House); Peter Marsden ‘Ships of the Port of London 12th-17th Centuries’; Fiona Rule ‘London’s Docklands’; Millicent Rose ‘The East End of London’.